What Is The Twice-Blessed Sale? Learn more from a recent article published in The Courier newspaper. We are a non-profit ministry that endeavors to help families find the children's items they need at a price they can afford. 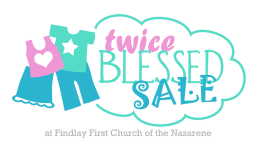 The Twice-Blessed Sale began in Findlay at the First Church of the Nazarene in the spring of 2006. It began with just a few dozen shoppers and has grown to thousands. 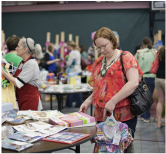 It remains a semi-annual event that hundreds of families come back each April or September for their child's clothing, furniture, toys, and more. In the spring of 2013 we computerized all of our sales transactions. With the help of a really cool software tool and the diligence of our consignors to register all of their items online, and print out labels, we have been able to speed up the check-out lines by more than double. Our shoppers gave a big thumbs up. Each sale, we also offer plenty of baked goodies for just a few dollars. This bake sale benefits our missions efforts in Haiti, where we have found many people there to be without basic clothing and other necessities. It's one more reason to host this sale so that children who don't have adequate shoes or shelter can be blessed as well. We offer well over 10,000 items at every sale! All sizes and prices are clearly labeled, organized and double-checked for quality! to find any sales promos. Consigning with us is simple. Register your items online before the deadline. Then pick a drop-off time. We do all the stocking and sales transactions and sorting any unsold items. Consignors can log onto our system and see what they have sold at anytime during or after each sale. Our consignors receive 70% of the sale price they label. 30% goes to children's ministries locally and overseas.